Garnier Skin Naturals Light Oil Control Fairness Cream - Press Release | Sahrish Adeel - Malaysia based Pakistani Beauty & Lifestyle Blogger! Leading international hair and skin care brand Garnier introduces a brand new product for Pakistani women this summer; Garnier Light Oil Control Fairness Cream. The launch of this fairness cream is another natural extension of the brands’ global technical expertise within its acclaimed Garnier Light range. 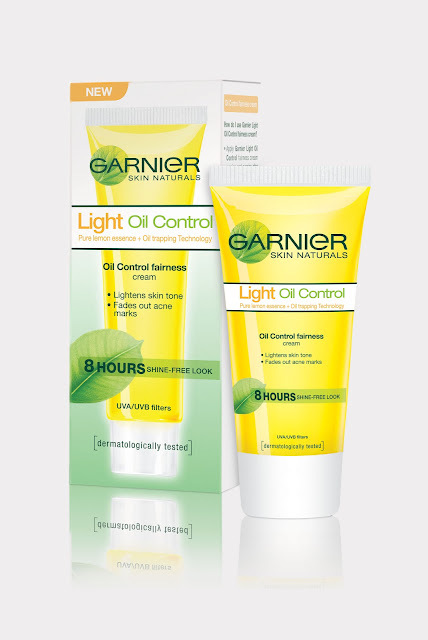 The naturally sourced Garnier Light Oil Control Fairness Cream is the latest innovation within the Garnier Skin Naturals Light range, which stands for fairness. The cream contains natural lightening power of lemon essence, renowned for whitening the skin tone, fading acne marks and providing flawless fairness. This natural power is combined with a unique oil trapping technology, which gives the skin shine free, matte based fairness lasting upto 8 hours. Furthermore, the Garnier Light Fairness Face Wash, used to clear impurities, make-up and which clarifies the skin, is a perfect complement to the fairness cream. Using the Garnier Light Oil Control Fairness Cream and Garnier Light Fairness Face Wash together yields the best and most effective results for oil free fairness. Garnier Light Oil Control Fairness Cream is appropriate and advisable for women of all ages and is recommended all year long and will be available at stores across the country in both a 40 ml and 20 ml convenient tube with an affordable price of PKR 199 and PKR 99 respectively. It’s all about Taking Care! Disclaimer: This is a press release. For more details, read Disclaimer.